The cover of the December 2010 issue of PDN which features an image by Todd Spoth. Back in October, I was browsing through my issue of PDN (Photo District News) magazine and came across an ad that was promoting one of their contests. I have never really paid much attention to contests, the few that I have entered in the past have been in the photojournalism realm and most of the contests that are advertised in PDN are more on the commercial side. This one was interesting though. The Ultimate Music Moment photo contest sponsored by Billboard Magazine sounded right up my alley. I have been involved in the music scene in some way ever since high school, whether that meant playing in bands, touring with bands, reviewing or photographing live music or just being a passionate lover of all things musical. 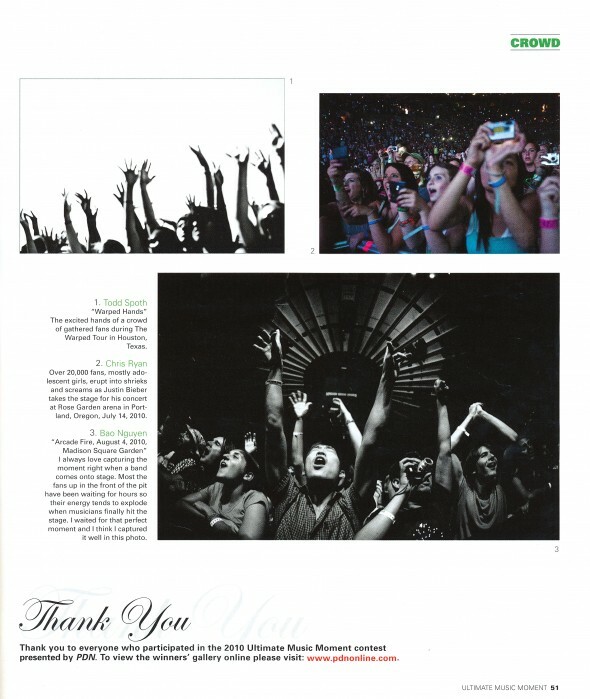 The Billboard/PDN Ultimate Music Moment photo contest consisted of professional and amateur divisions, and had three categories; artist portraits, performances, and crowd. Not only did the contest appeal to my interests, but it sounded familiar. I pondered for a few moments before it hit me. Just a few weeks prior I was working with former Life Magazine photographer, Joe McNally here in Houston. During a break, his first assistant, Drew Gurian, and I got to talking about music, as we are both musicians and love photographing live music, and he had told me that he was a winner of this same contest the year prior. Weeks passed and the deadline for entry loomed. During mid-October I found myself on a trip to Europe. It was during that trip that friend and colleague Eric Kayne reminded me that the deadline for entry was that same night. Eric was eager to enter his own images of indie band, Arcade Fire, and here I was, in Europe, about to miss the deadline. I was away from my image archive and on the road with my Mac Book Pro. Thankfully I was able to find high-resolution versions of the images I wanted to enter in my Photoshelter online archive. Phew. I went to the contest’s website, entered my 2 images (seen below), begrudgingly paid my entry fee and hit submit. 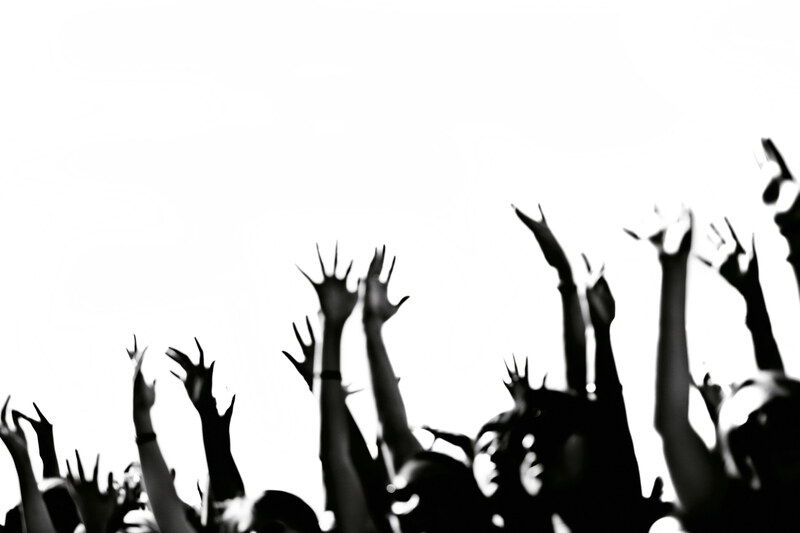 "Warped Tour Hands" by Todd Spoth, winner in the "crowd" category of the 2010 Billboard Ultimate Music Moment photo contest. 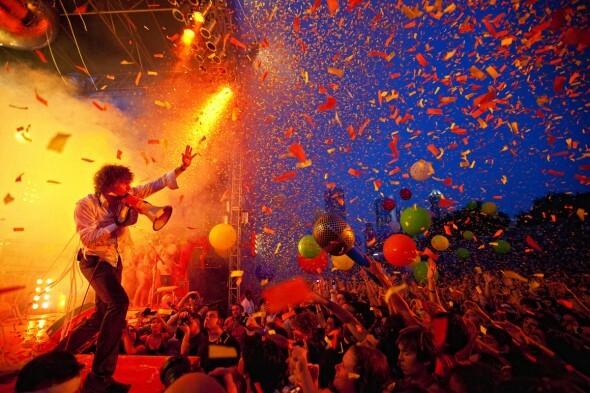 Image of The Flaming Lips at Summerfest 2010 in Houston, Texas taken by Todd Spoth. After a few more weeks had passed, I had all but forgotten about the entered images, until I received an email from an editor at PDN magazine informing me that my image was a finalist and that I needed to submit a higher resolution version of the image that made the cut. I excitedly submitted the image and eagerly waited for the December/January issue of PDN, where the winner’s gallery for the contest would be published. About a week or two ago, I finally received my copy of that issue, opened it up, and was excited to see one of my submitted images, an image I captured at a local Warped Tour music festival, published in the winner’s gallery. My black and white image of the hands of a crowd of Warped Tour spectators has always been a favorite of mine and now it had won in the crowd category of this contest. Each winning photo was accompanied by a short blurb that the photographer wrote about his or her particular image, detailing how the image was captured and although I too submitted details for my image, it seems they pulled the generic caption information from the file’s IPTC data and printed that. Regardless, my image is there, and my name is with it, and that’s all that matters. Maybe now I’ll actually get around to updating my website with more live music images. Below are the scans of the title page of the contest’s winner’s gallery section in the December/January issue of PDN, as well as the page where my image is featured. They are scans so apologizes for the ghosting as PDN’s pages are pretty thin. 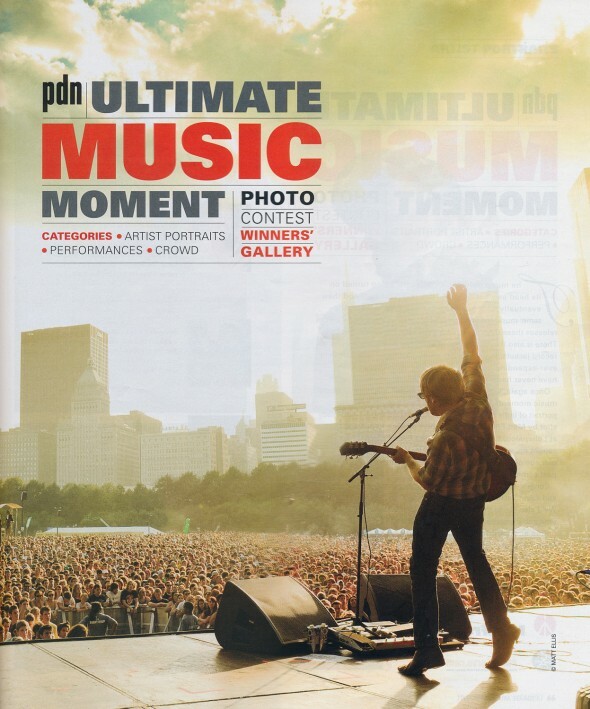 The title page for the Ultimate Music Moment photo contest winner's gallery. The Ultimate Music Moment photo contest winner's gallery page featuring a photo by Todd Spoth.